The congregants thanked God that they weren’t like all those hopeless people outside the church, bound for hell. So the Westboro Baptist Church’s Sunday service began, and Rebecca Barrett-Fox, a curious observer, wondered why anyone would seek spiritual sustenance through other people’s damnation. It is a question that piques many a witness to Westboro’s more visible activity—the “GOD HATES FAGS” picketing of funerals. 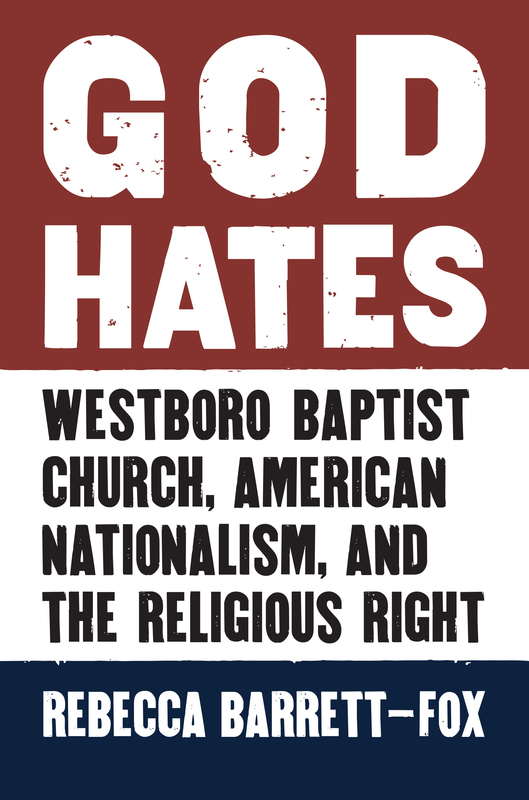 In God Hates, sociologist Barrett-Fox takes us behind the scenes of Topeka’s Westboro Baptist Church. The first full ethnography of this infamous presence on America’s Religious Right, her book situates the church’s story in the context of American religious history—and reveals as much about the uneasy state of Christian practice in our day as it does about the workings of the Westboro Church and Fred Phelps, its founder. God Hates traces WBC’s theological beliefs to a brand of hyper-Calvinist thought reaching back to the Puritans—an extreme Calvinism, emphasizing predestination, that has proven as off-putting as Westboro’s actions, even for other Baptists. And yet, in examining Westboro’s role in conservative politics and its contentious relationship with other fundamentalist activist groups, Barrett-Fox reveals how the church’s message of national doom in fact reflects beliefs at the core of much of the Religious Right’s rhetoric. Westboro’s aggressively offensive public activities actually serve to soften the anti-gay theology of more mainstream conservative religious activism. With an eye to the church’s protest at military funerals, she also considers why the public has responded so differently to these than to Westboro's anti-LGBT picketing. With its history of Westboro Baptist Church and its founder, and its profiles of defectors, this book offers a complex, close-up view of a phenomenon on the fringes of American Christianity—and a broader, disturbing view of the mainstream theology it at once masks and reflects. Rebecca Barrett-Fox is visiting assistant professor of sociology at Arkansas State University, Jonesboro.